While Dredd 3D fans fruitlessly petition for a sequel, and star Karl Urban continues to champion the idea, producer Adi Shankar has taken it upon himself to give fans what they want. 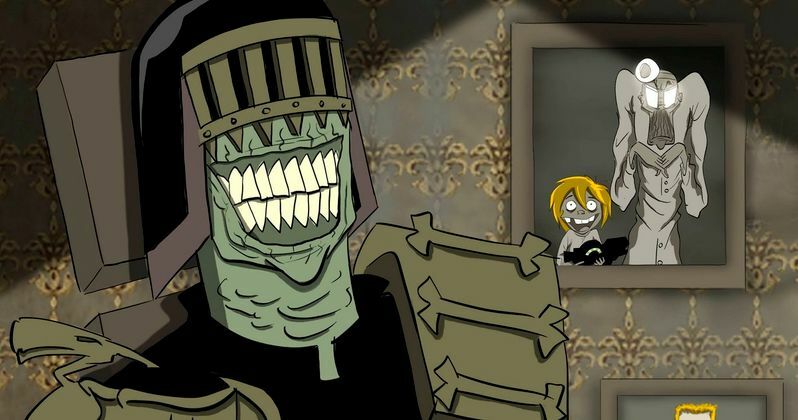 He's created an 'unofficial' spinoff in the form of a new animated web series title Judge Dredd: Superfiend. And EW has our first look with the poster and four images. It has been two years since Dredd 3D hit theaters, and while it wasn't a smash hit at the box office, it has spent the past 24 months accumulating a very strong fanbase. While no sequel has been officially green lit at this time, Adi Shankar is delving deeper into the mythology of 2000 AD, the British comic that spawned it. Judge Dredd: Superfiend will be inspired by the fan-favorite 'Dark Judges' storyline, and its intended as a sort-of sequel to Dredd 3D, though it is also a part of Adi Shankar's 'Bootleg Universe', which includes the unofficial short film The Punisher: Dirty Laundry, which brought Thomas Jane back to his role as the Marvel vigilante, and the Venom short Truth in Journalism. The animated Judge Dredd: Superfiend does include characters from the 'Dredd-verse', which you can see in this cool new poster and the four images being used to tease the impending release, which will debut later this month. No release date has been announced for the first episode as of yet.